The artist transferred to the canvas his comprehension of the beauty of nature. The picture is saturated with the aromas of magnificent foliage of trees, protecting from the hot sun. It embodies the praise of Italian nature. The painter was able to convey the transparency of the air, the picturesqueness of the trees, while maintaining the infallibility of the shades, a single consistency, spiritualizing everything with his talent. The canvas depicts the painter’s favorite motif – the alley, which, like a tent, is covered with trees closing over it. This leitmotif is repeated in many paintings in different versions. 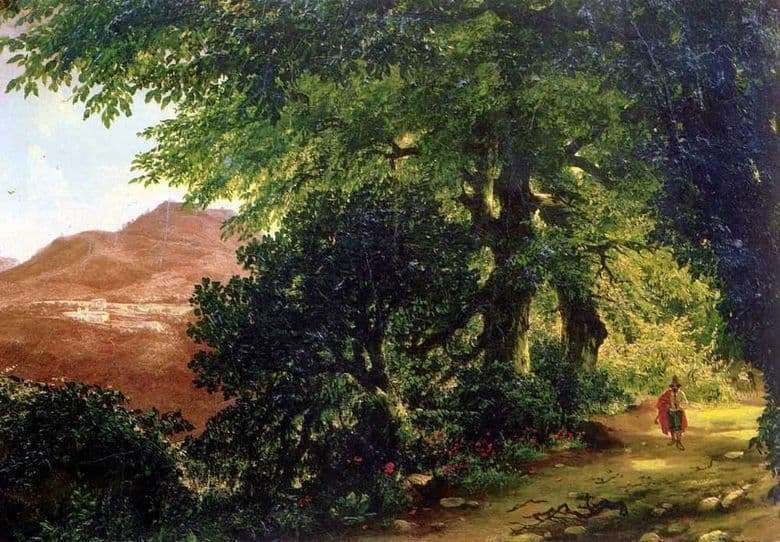 Lebedev felt and conveyed the beauty of this avenue hidden in the park’s wilderness, imbued with sunlight, as if purposely created nature for those who seek solitude and silence. The canvas is written in the tradition of romanticism, and the abundant Italian nature perfectly corresponds to the artist’s sublime idea of ​​beauty and the ideal. With great emotional tension and plasticity, Lebedev represents in his landscape the wealth and luxury of the plant world. He imposes on the canvas thick strokes of intense bright natural colors, the radiance of solar streams, the invisibility of air. The painting bears a festive mood, demonstrating how the author himself was able to enjoy beauty in the world and nature. The artist revealed for the Russian landscape painting the pattern of the ratio of warm and cold shades. The bright sun in the picture illuminates the foliage with golden rays and makes it warm, and in the shade, where the sky blue glows, it becomes a cool emerald green color. The sandy path in golden and orange tones, getting into the shade, acquires blueness. Lebedev’s favorite composition with a shaded arched alley acquired on the canvas a luminous air filling due to the lyricism of light colors. The author as if invites viewers to enter under the shade of a hundred-year-old oak forest and leads them to mysterious distances. Trees occupy almost the entire canvas, only above is given a small fragment of the sky. The landscape includes a figure of a man in a pointed hat and a bright red cloak, enriching the coloring of the picture. But this figure is of secondary importance, serves simply to revive the view. The landscape is built on the contrast – the comparison of light spots with the shadow of dense forest undergrowth.